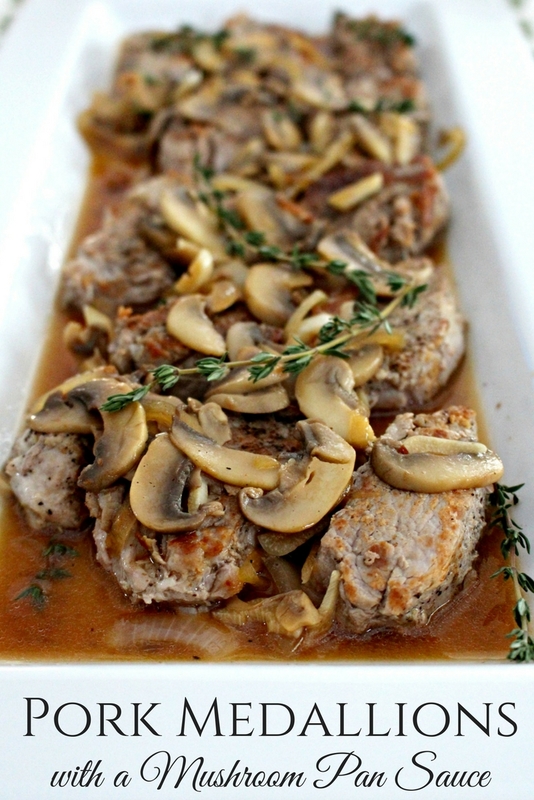 Tender pork medallions seared to a golden brown and served with an herbed mushroom pan sauce. And yes, this is a 25 minute meal! 25 minutes for something this elegant? Yes! 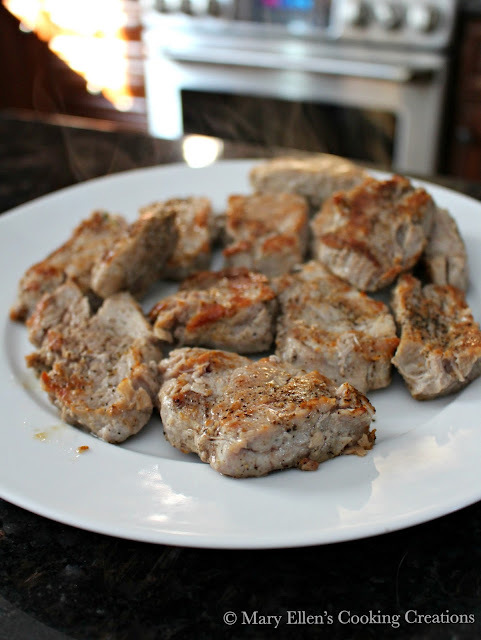 Slicing a pork tenderloin into medallions is an easy way to prepare this cut of meat. Often we will grill or roast it, but searing medallions brings something else to the table. Once the medallions are seared you are left with a pan full of brown bits. I never let those brown bits go to waste - they hold so much flavor! Bring on the deglazing for a flavorful pan sauce! 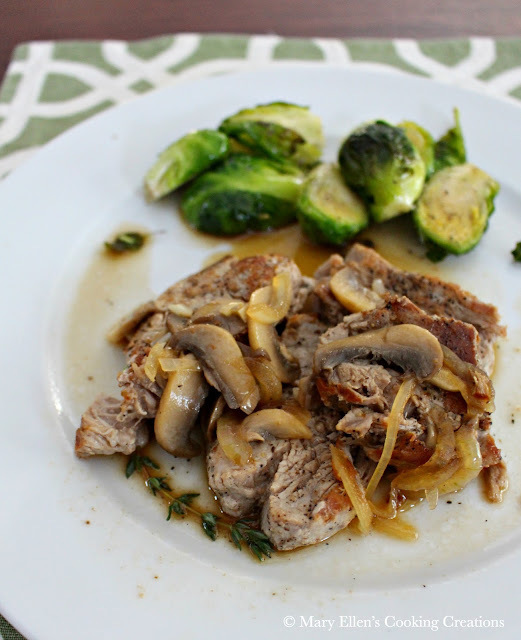 For this dish I chose to use earthy flavors mushrooms and thyme, two things that go perfectly together. The color was so rich, too. Can you imagine the oohs and aahs you'd hear as you set this serving dish down at a dinner party? 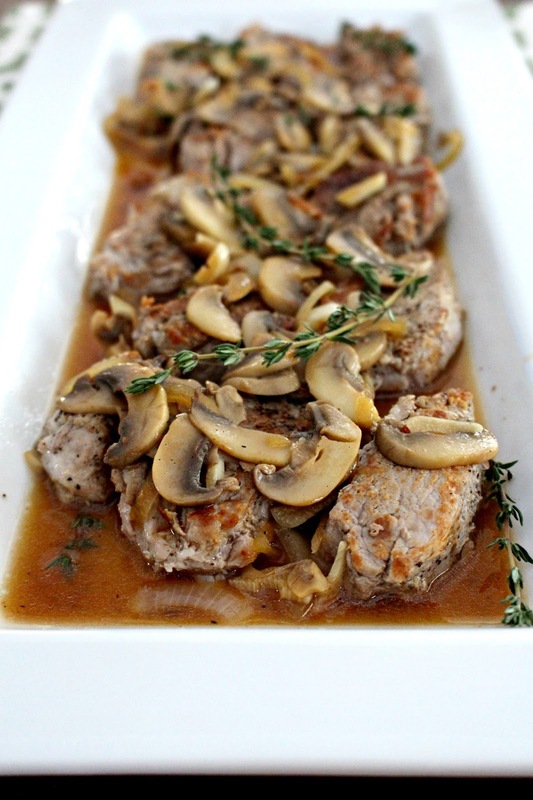 I love it - fancy enough for a dinner party but easy enough for a weeknight meal. Heat olive oil in a large saute pan (I prefer a stainless pan as opposed to a non-stick pan). Add the pork and cook 4 minutes on one side; flip and cook for 4 minutes on the other side. Transfer to a dish. Add butter to the pan. Once melted, add the mushrooms and saute for 4 minutes. Add the onions and saute for 2 minutes. Add the garlic for 1 minute. Add the wine to the pan and stir, scraping up all of the brown bits. Add the broth and thyme leaves from one sprig. Bring to a simmer for a few minutes. Taste the sauce and adjust salt and pepper, if needed. 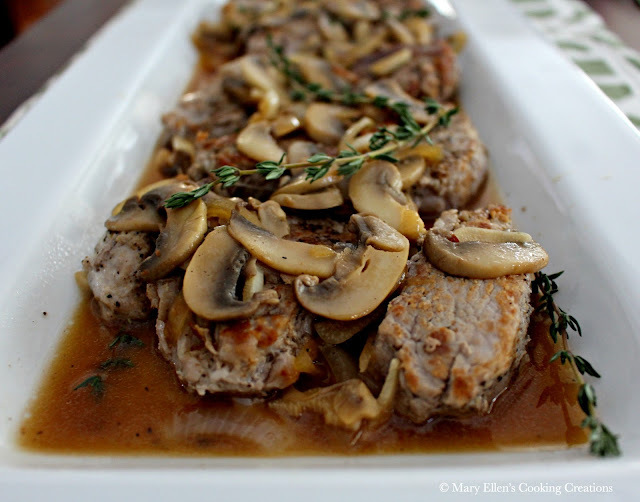 Pour sauce and mushrooms over the pork and garnish with the remaining sprigs of thyme. GORGEOUS pictures, Mary Ellen!! This looks fantastic.